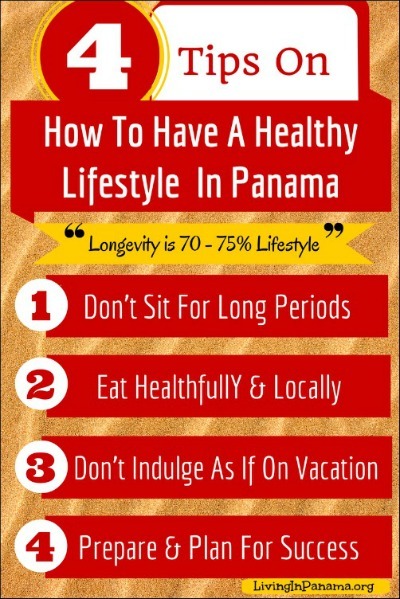 It can be difficult to maintain a healthy lifestyle when you move to Panama. The ubiquitous fried foods and the ever available sugary processed treats tend to add pounds to the waistline. While there are health food stores and gyms in many locations, they are not available everywhere. Even when they are, they might not be up to the same standard as your gym at home. And what you eat is only one factor. Maintaining a healthy lifestyle – with exercise – is also a challenge. Suddenly being in a totally new culture, and often hotter climate can sometimes change an energetic and engaged person into a sedentary and lazy person. But that is easily remedied. 1) Don’t Sit For Long Periods – Move and Keep Active. Don’t let the heat prevent you from keeping active. As the quote above indicates, you are the captain of how healthy and fit you are as you age. Your genes are not the prime reason for how you age. You are in charge of 75% of how you will age. A key way to keep healthy and active is to keep moving. Even a regular morning jog cannot overcome the negative impact of sitting for long periods during the day. Here are some ideas for integrating activity throughout your day. Get in the habit of regularly walking, swimming, running, etc. One of the wonderful aspects of living in Panama is that nature is never far away. Go explore the tropical paradise around you, and make sure to move your body while you do it. To avoid the heat, do your most strenuous exercising in the early morning or evening hours. You can grow your own food or buy from the many fruit and vegetable stands in Panama. Buying your produce from street stalls is not only a great way to meet and greet people in the community, but you are supporting local business. Also, the produce is usually much cheaper than in the grocery store. You may want to read this post about buying local produce in Panama. Order online for delivery or pick up. Pick up Orders. You can pick up your order on Tuesdays. That is, from the Boquete Market on Tuesday morning or in Dolega or David on Tuesday afternoons. Order deadline for a Tuesday pickup: Monday at 7:00 am. Deliveries. They offer deliveries of prepaid orders on Thursdays for any area served by Uno Express. For example, they deliver to: Bocas del Toro, Santiago, Las Tablas, Coronado, El Valle, Altos del Maria, Gorgona, La Chorrera, Panama City, Colon, and Puerto Armuelles. They also offer deliveries to Volcan on Fridays afternoons. To initially set up deliveries, you will need to contact Richard, the bi-lingual farm manager, at 6242-9308. He is available Monday – Saturday from 7am-7pm. You will also need to set up an account on their website. Facebook page: They have a facebook page too. Phone Finca Santa Marta at 6242-9308 or 777-9229 or 540-560-9680 (USA cell phone) for further information. Growing your own vegetables is also a good way to ensure you have a sufficient supply of basil, spinach, and other vegetables that you may love, but are not commonly grown or sold in Panama. You can also learn how to grow various indigenous fruits and vegetables. If you want to grow pineapples, we have a brief guide on how in this pineapple post. Gardening is also a good way to keep active as well. 3) Make A Life In Panama – Don’t Indulge As If On A Permanent Vacation. You are living in the tropics. The palm trees, coconuts, and warm sunny weather inspire all of us with visions of hanging out in a hammock sipping margaritas. Life near the equator is more relaxed and carefree. However, sometimes new expats treat themselves as if they are on an extended vacation. The cocktail hours begins earlier and earlier in the day. Hammock time and indulging in special treats will become the norm. While feeling like you’re on a permanent vacation is great, developing a habit of unhealthy indulgence is far from ideal. Too many indulgences can make you feel sluggish and unmotivated. It is better to develop healthy indulgences. You can try to make daily yoga, beach walks, sunset gazing, and cooking a healthy meal your new indulgences. For most of us, the point of retiring is not to create a life of doing nothing. The idea was to engage in activities that you enjoy, to learn new activities, and to relish life. So whatever it is you wanted to do before you moved to the tropics, do it. Also be on the lookout for new activities and learning opportunities you can engage in. For the most part, the more active and engaged you are more motivated and energetic you become. Planning ahead can help you accomplish your goal of a healthy lifestyle. Buy the seeds for your ideal garden. If you plan on gardening, arrange to have seeds of your favorite vegetable. Sometimes it takes a little searching to find seeds that thrive in tropical environments. Of course, you can also ask people in the area for the seeds from their produce. Ask people for tips on what grows best and how to grow those items. Find out what organic produce is available in your area. Check out Finca Santa Marta’s website and see how you can integrate their organic produce, meat, eggs, and more in your life. Bring healthy cookbooks that have recipes featuring the produce that grows in your area. The best produce to use in your cooking is locally grown and organic. Panama offers a number of fruits and vegetables that will be new to most expats. If you like to cook, it is fun to explore these new Panamanian foods and recipes. Discover all the different things you can do in your area. To discover some of the outdoor pursuits you can enjoy in the Puerto Armuelles, click here. I am sure other websites have also listed activities available in their areas. With some planning, it will be fairly easy to achieve the tropical lifestyle you have been dreaming about. Find out more about our wonderful beach town of Puerto Armuelles. Please send single family res. and lots on the water. Also units that can be rented out to vacationers.